After the summer break I’m back working on the blog, and would like to share an interview with teacher and author Nina Weinstein. While doing some research on reduced forms earlier this year, I came across the incredibly useful book “Whaddaya Say?”. I wrote a short review of the book and how I plan to use it as a resource in future Raising Language Awareness workshops. Matt: Thank you for taking the time out of your schedule to speak with us today. You have written many books on language – with “Whaddaya Say?” leading the list. It’s a great resource for EFL teachers who would like to spend time focusing on reduced forms with their learners. First…. how common are reduced forms in speech? Nina Weinstein: They’re very common! Let me give you an example from my research, which consisted of all highly educated people (with a master’s degree or above) speaking in an unscripted way. After analyzing seven hours of unscripted recordings, I discovered that the speakers were using reduced forms – that is using pronunciations like *wanna or *hafta – 82% of the time. You can find a summary of this research in the back of my book “Whaddaya Say?”, which is a listening and accent reduction book focused on the way native speakers really pronounce English – in particular, the seventy-five or so reduced forms of Enlgish (*wanna, *hafta, *gonna, *Whaddaya, etc). First, to give you a clearer idea of how people reduced sounds in certain words or word groups, I divided the reduced forms into three different levels of reduction. Level One – no pronunciation change from the written language. Level Two – there was one pronunciation change – like a vowel being reduced. An example of this would be “want to” becoming *want ta. Level Three – had the most reduction – Example: “want to” changing to *wanna at a natural speed. Based on my research a reduced form was used in natural speed English about every minute. Matt: Do you think that native speakers realize the challenges they present when speaking internationally? Nina: I’ve been working within Toyota for 14 years, and the English speakers there who deal with the Japanese are very sensitive to their language. However, many speakers outside the company are totally unaware of the challenges they are presenting – they have no idea. They’re simply unaware of how to simplify, and what they should focus on if they were trying to become more tuned in. Matt: Where do you think the business people within Toyota learned this sensitivity? Was it from experience or do you think that they participated in some focused training on the clarity of their language? Nina: There are people in the company that have become more sensitive in both ways. Experience in working with non-native speakers clearly helps and can do wonders in making one more aware. Matt: If you could run a workshop or training session on raising language awareness and sensitivity with native English speakers, what would you do? I don’t believe I would focus a lot on the “sentence blending” for native English speakers. One thing those years of experience in-company have taught me is that as a business English trainer, I have to sift things down to the most important aspects. These are business people and they’re there to do business – not to become linguists. They can’t focus on everything. I think the same would be true for the native speakers in a training session. We just need to give them the most important things. In terms of reduced forms, that would be the first 21 units of the book “Whaddaya Say?”. .. those are the most crucial. It was really funny because they all started laughing very quickly. They realized they couldn’t do it. Without reduced forms, it didn’t sound natural to them. If you take out the reduced forms, you take out the naturalness. An activity like that could be a good warm up… and get everyone thinking about what reduced forms are and how often they use them. There are other things I might focus on, like on expressions of restatement or clarification. I do that a lot with my business English learners, and I believe everyone can benefit from those skills. I’d encourage the native speakers to use those clarification and restatement expressions without concern. To use them doesn’t mean there is anything wrong or a problem. It’s just something we all should do to make sure we’ve received the message clearly. There are so many things that can cause confusion in communication…. connotation, body language (such as a listener sitting all boxed up or glancing at their watch)…. that it’s a reasonable thing to want to clarify. Matt: What are some of the other components you work on with your English leaners? Knowing more about that can also help us native English speakers become more aware of what problems we may present in normal speech. Nina: Well, one of the hardest things for English learners in the business world is participating in meetings. I’ve worked at companies like Toyota Motor Sales for a long time, and I focus a lot on helping non-native speakers understand people in business situations. When we speak one-to-one with somebody, there’s a lot of organization going on, even though we may not realize it. We’re turn taking, and so there are many expectations that the listener has that can help them with understanding… and that goes for any language. Personally, when I teach, I use a listening program that I constructed after years of experience which begins with some main listening tools. They include looking at reduced forms but, I also highlight “sentence blending rules”. I talk about the music or rhythm of the language, and of what blending is, and how one can learn these “blending rules”. Native speakers automatically know them and non-native speakers can learn them. 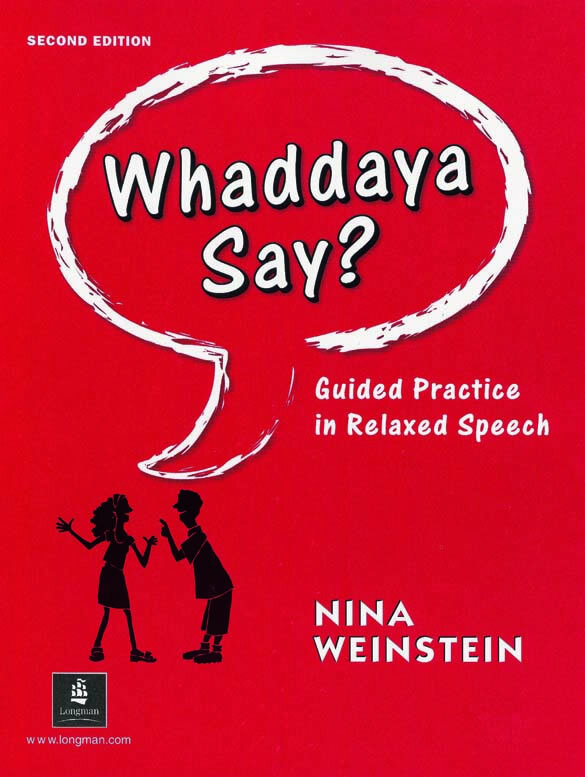 Matt: There are many listening exercises in your book “Whaddaya Say?” in which learners compare the various reductions of speech. Have you ever been able to get authentic audio for in-company use? Nina: Good question. It’s something that’s not easy to get but extremely valuable, as we all know that many business meetings can just become a free-for-all – without a clear order of turn-taking, fragments of language being thrown out, unscripted free-flowing dialogues, people speaking at the same time as each other, interruptions, and so on. There are really a lot of things that can happen. The problem, of course, with getting authentic audio from business meetings is what company would want to have their internal conversation get out there? It’s private information, and even if it isn’t sensitive material, there’s a chance that somebody within that meeting may not like the way they are portrayed in the recording, even if only for a few seconds. So though it would be wonderful for training purposes, it’s hard to get. Saying all that, I have been able to get some recordings. In one case, I got a group to record their business meeting and was able to use it for internal training only. It was on the most benign subject ever… 🙂 ….. It’s definitely not the most exciting material you’ve ever found…. (If it were I would have never been able to record it.) but it’s authentic and it has many of those typical meeting moments that are useful for listening comprehension and training. I was only able to get that after establishing myself within the company as a trainer and a professional, and after enough trust had been built up with all parties involved. Matt: Those types of recordings would be wonderful to use not only for employees learning English, but also in a raising awareness workshop. I find that authentic examples can be extremely powerful. You also have a new website for English learners – where almost all of the audio from “Whaddaya Say?” can be found. Can you tell us a little about it? Nina: Yes that’s right. I started the website earlier this year, and it’s full of material that I’ve created over the years and that I continue to create. There are a lot of listening comprehension activities, but it’s actually a full English program, from the beginning. I have to say that it’s a lot of fun interacting with all sorts of English learners from around the world – and I interact with them as much as possible! I’ve been in the field for so many years and want to share the best of what I’ve learned and perfected over that time. There are so many websites out there for learning English but it can be tricky knowing just where the material from those sites comes from. One can find online trainers with experience or… if a learner is unlucky…. find somebody with little or no language training experience at all. So I believe a strength of my site is that the learners have the chance to interact with a professional with loads of experience. There are more than 80 interactive lessons on there now with practice in vocabulary, conversation, workplace and business English, pop music, English lessons using television comedies… with more coming all the time. I’d like all of this material and these ideas to exist somewhere besides the books I’ve written over the years… After all, I don’t want to take all of these ideas and refined lessons to the grave with me :-p I’d like them to be out there somewhere. (www.easyenglish.us.com — Click on “Whaddaya Say Digital Audio”)! Matt: That’s especially important for people interested in getting the audio from “Whaddaya Say?”, as when I ordered the book on Amazon earlier this year, I only had the option of ordering cassette tapes…. ;-o So anyone interested in getting that audio should take a close look at Nina’s website as one can find some very high quality digital audio there as a member. As a trainer, it’s a much more cost-effective way to get access to the material and you’ll have the extra bonus of being able to interact with Nina. Note – An asterisk (*) is used on reduced forms to show they’re appropriate for spoken English, but not written English.